Reel Artsy: One Movie I Can't Wait to See: Disney's A Christmas Carol in 3d! One Movie I Can't Wait to See: Disney's A Christmas Carol in 3d! 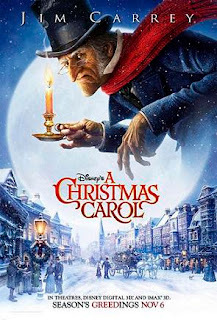 Disney's remake of A Christmas Carol comes out November of this year. YAY! This is going to be really good, not only because it's Disney, but because it's motion capture (think Polar Express, or Beowulf) AND 3d! The movie stars Jim Carrey and ♥Cary Elwes♥ (The Princess Bride, Robin Hood: Men in Tights) along with Gary Oldman (Harry Potter Series, Batman Begins). Jim Carrey's character looks kinda creepy in tat clip but I'll probably check it out. I love that 3D movies are coming back in style. I could never go see them as a kid! Jim Carrey actually plays Ebeneezer Scrooge AND all three ghosts. I'm hoping it's reeaaally creepy like Coraline!